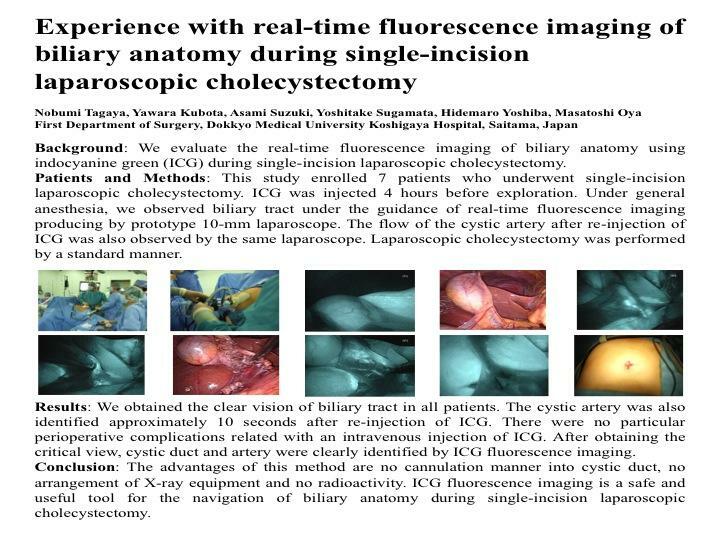 Background: We evaluate the real-time fluorescence imaging of biliary anatomy using indocyanine green (ICG) during single-incision laparoscopic cholecystectomy. Results: We obtained the clear vision of biliary tract in all patients. The cystic artery was also identified approximately 10 seconds after re-injection of ICG. There were no particular perioperative complications related with an intravenous injection of ICG. After obtaining the critical view, cystic duct and artery were clearly identified by ICG fluorescence imaging. Conclusion: The advantages of this method are no cannulation manner into cystic duct, no arrangement of X-ray equipment and no radioactivity. ICG fluorescence imaging is a safe and useful tool for the navigation of biliary anatomy during single-incision laparoscopic cholecystectomy.